First half assessment – let’s see, the little round red thing with the strings hanging on it; we’re supposed to hit that, right? 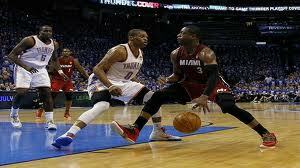 Miami came out of the gates scorching hot and the Thunder looked in trouble from the get go. Lebron was shutting everything down that came his way and role players like Mario Chalmers and Shane Battier were hitting their open shots on every James or Wade doubled pass out. OKC’s real 6th man, their fans, were removed from the game quickly and the advantage that has helped the Thunder remain perfect on their home court during the postseason was no longer present. Coach McFly called multiple time outs and made earlier than usual substitutions to try to answer this Miami Heat onslaught. Trailing by as many as 13 in the first half, OKC did everything they could just to stay alive in the game and keep themselves within a small run to mount a comeback. Okay, so those other 3 guys in the white uniforms are allowed to score too? No one told me! After slicing the Heats’ lead nearly in half and trailing only by 7 points going into halftime, the Thunder looked as if the momentum in the game was falling in their favor. At this point in most Miami Heat recaps of games, I would usually find a way to insult coach Spoelstra but I think I can leave him alone for this one. Clearly the Thunder had a halftime plan and they executed it perfectly. Their plan of, “pass the ball the Kevin Durant or Russel Westbrook and score,” seemed to work flawlessly as the two players single-handily out scored the entire Miami Heat team in the second half 41-40. Add that with the support they received from Serge Ibaka and Thabo Sefolosha and you have a half of basketball completely dominated by the home team. It seemed as if every time that OKC had an offensive possession, they scored. 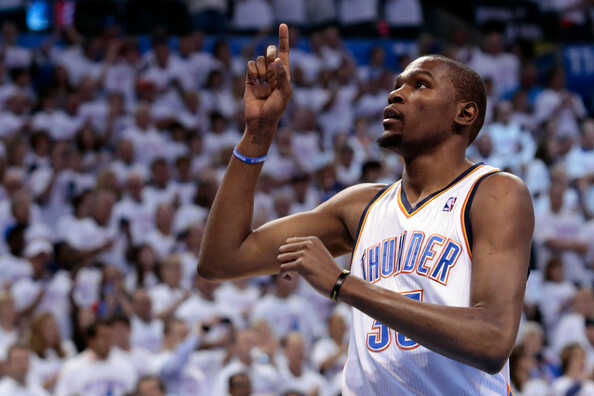 Durant scored 17 of his 36 points in a true anti-Lebron fashion…he did it in the fourth quarter. Westbrook nearly had a triple double with an impressive stat line of 27 points, 11 dimes and 8 boards. Heat Lightning not as bright as the Claps of Thunder! With their 104-95 loss in game 1 to OKC, Miami is going to have to develop a game plan to see if they can weather the Thunder’s storm leading into game 2. Step one should be helping Dwayne Wade find his old form that made him the 2006 NBA Finals MVP. Wade started the game sluggish and finished even worse. He scored a meaningless 19 points on 7-19 shooting, which is only as good as it was because of a few nice dishes from Lebron that made for easy layups. Miami stands no chance of beating this young and talented Thunder team without exceptional games on a nightly basis from both Lebron and Wade. 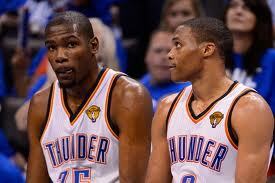 The same goes for OKC’s Durant and Westbrook. These teams lean heavily upon their stars and in game one, Miami’s two scored a combined 49 points compared to the 63 scored by Duranbrook or Westurant…you choose. I also think that for Lebron and Wade to find themselves open more often, Miami’s worthless coach Erik Spoelstra (I knew I couldn’t make it through the whole article), is going to have to start Bosh. I don’t think it’s rocket science, I mean this guy is paid $20 million a year and is one of the best perimeter PF/C shooters in the game. Game one is over and I am sure all the basketball fans in the world like myself are craving game 2 but we will have to wait until Thursday night to see it. I predict that the Thunder will remain perfect in the sea of Blue that fills the Chesapeake Energy Arena on a nightly basis. This entry was posted on June 13, 2012 by MatthewToddErich. It was filed under Basketball, Miami Heat, NBA Finals, Oklahoma City Thunder and was tagged with Dwayne Wade, Kevin Durant, Lebron James, Miami Heat, OKC, Russel Westbrook, Thunder.